Saptco smart card for buses inside cities can buy from the driver or you can use the allocated vending machine to issue the card. 1. 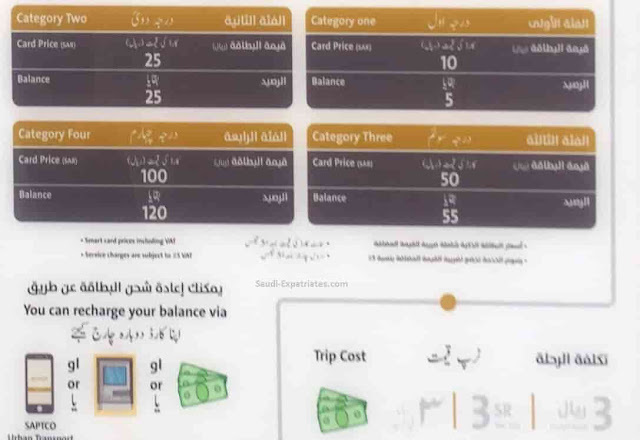 For SR 10, you will get a smart card and a balance of 5 Saudi Riyals in it. 3. For SR 50, Commuters can get a smart card along with a balance of 55 Saudi Riyals in it. 4. For SR 100, Commuters can get a smart card including a balance of 120 SR in it. You can recharge your Saptco smart card through the bus driver or with a vending machine.